Europe's Ariane 5 commercial launcher carried out another uneventful trek to orbit Saturday night, successfully deploying a powerful broadcasting bird for the Arab world and a unique spacecraft to see and communicate with South Korea. The rocket roared away from a jungle launch base on the northeastern coast of South America at 2141 GMT (5:41 p.m. EDT) atop the thrust produced by its hydrogen-fueled main engine and twin solid boosters. Tracking eastward across the Atlantic Ocean and then Africa during the half-hour flight, the cryogenic upper stage delivered the required push to reach a geosynchronous transfer orbit with Arabsat 5A and COMS, the Communication, Ocean and Meteorological Satellite. Technical troubles had delayed the liftoff twice this week, including two last-second aborts during Thursday's countdown due to pressurization readings from the vehicle's main stage. "This launch was performed with a delay and after several attempts. 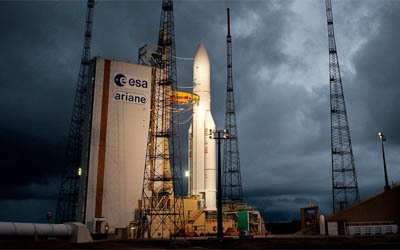 Nevertheless, it's a perfect launch," said Jean-Yves Le Gall, chairman and CEO of Arianespace. "It shows clearly that our quality policy is exactly what you expect from us." "Better being late than never, but we're glad we made it," said Khalid Balkheyour, Arabsat president and CEO. "We've been waiting for this launch for quite some time. Space technology is complex, we have to be careful with what we are doing. And I'd really like to thank Ariane, led by Mr. Le Gall, and all his team." The Ariane achieved a highly elliptical orbit stretching 22,352 miles at its farthest point from Earth and 155 miles at the nearest. The satellites will use their onboard engines to circularize the orbit and reach geostationary slots in the coming weeks. Riding in the upper position of the rocket's dual payload stack was Arabsat 5A, the second new spacecraft launched just this month for the Arab Satellite Communications Organization. Arabsat 5A and the Badr 5 direct-to-home television satellite, which flew aboard a Russian Proton rocket on June 3, are the first members for the organization's fifth generation of satellites. 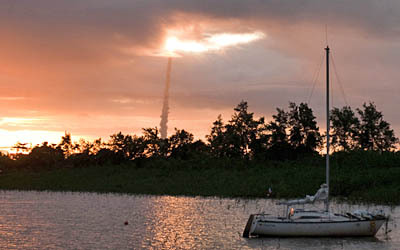 The original generation a quarter-century ago included one craft launched aboard space shuttle Discovery in 1985. The Arabsat group, based in Riyadh, Saudi Arabia, operates a cluster of orbiting satellites to reach millions of homes in over 100 countries across the Middle East, Africa, Europe and Asia, relaying hundreds of television channels and radio stations. This latest craft sent aloft Saturday will be parked alongside the aging Arabsat 2A in geostationary orbit at 30.5 degrees East longitude some 22,300 miles above the equator. Built jointly by Astrium and Thales Alenia Space, Arabsat 5A is a Eurostar E3000-style satellite with a 15-year design life and weighing nearly 10,900 pounds at liftoff. It is equipped with with 26 C-band and 24 Ku-band transponders for business services and television signal routing across the Arab world. 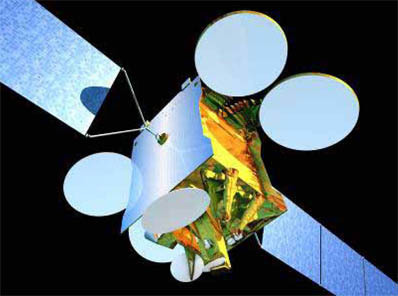 "Arabsat 5A multi-mission satellite will provide additional capacity at 30.5 degrees East for a large range of satellite communications services such as television backhauling and broadcasting, telephony, business communications, Internet trunking and the provision of VSAT and other interactive services, over the whole continent of Africa, Central Asia and Middle East region," Balkheyour said. Sharing the ride to orbit aboard the Ariane 5 rocket Saturday was COMS, a satellite for South Korea to perform three very diverse roles from geostationary orbit at 128.3 degrees East. It features an experimental Ka-band communications package, a weather observation system and equipment to study ocean color and the marine ecosystem to aid the fishing industry. 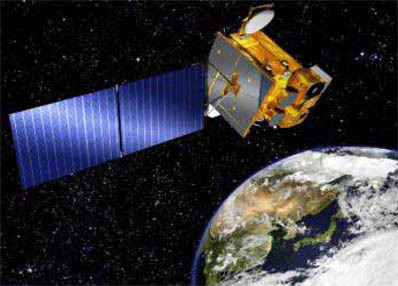 "One of the main utilizations of this satellite is monitoring of the Earth's environment from geostationary orbit," said Herve Lambert, COMS project manager at Astrium. "For meteorology, the imager allows observing of fast, evolving situations such as the Yellow Sands in springtime in Korea and other phenomena such as typhoons. "Observation of the ocean color from this orbit also allows the monitoring of very short-term phenomena such as tide effects, which has never been done from any other similar satellite." Astrium built the spacecraft for the Korea Aerospace Research Institute. The 5,400-pound bird, based on the Eurostar E3000 model, has a 10-year mission. The craft will improve life on Earth, said Young Shik Kim, South Korea's assistant minister for education, science and technology. "I am sure our successful launch tonight will help promote the development of space science as we go forward," he added. Saturday's launch represented the 195th flight for the Ariane rocket family, the 51st for the Ariane 5 vehicle and the second of six-or-seven expected this year. Next up is the planned August 3 launch carrying the African Rascom-QAF 1R and Nilesat 201 telecommunications satellites. That will be followed by Flight 197 in early September with Eutelsat's W3B and the Japanese BSAT 3b spacecraft. "Since the creation of our company 30 years ago, we have successfully launched 281 satellites," Le Gall said. "And this will continue, as our order book today has 34 satellites for launch to geostationary orbit, along with six Ariane 5 missions with the Automated Transfer Vehicle, and 17 launches to be performed by Soyuz. "And since the beginning of 2010, we already have signed nine new contracts - the latest of which is with the Argentinean operator Arsat, which I am announcing tonight as a new contract."